Then there’s the content. This morning 1st Science got to meet Heat and Temperature for the first time. This is my favourite kind of topic – quite simple but of fundamental importance. ‘Heat is a form of energy’, we tell our students, and ‘temperature is a measure of heat’. Actually, the discovery that heat is simply a form of energy was an enormous advance in science, possibly the greatest breakthough of 19th century physics. And what sort of energy is it? Well, kinetic energy arises due to the motion of molecules (vibration in solids). But there is also potential energy; since atoms in solids have more-or-less fixed positions in the lattice they have must possess an associated potential energy (so do atoms in liquids for a slightly more subtle reason). So heat is basically a type of internal energy. Except that it’s not always internal; there is also the whole business of heat transfer, a phenomenon that can occur by any or all of three very different mechanisms! Oops! I thought the dial read zero on the LHS but it doesn’t of course. Also, I’m not sure why it reads degrees Kelvin, there is no such thing. There is also something similar with the case of mass and weight. It is very annoying when these terms are used out of context on tv and the media. To the general public they don’t discern any difference between the two terms but to anyone with any bit of science background there is a very obvious difference. 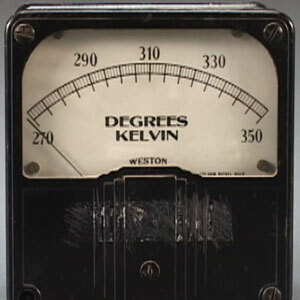 I believe the unit “kelvin” used to be referred to as “degrees Kelvin” (aka “degrees absolute”) and even had the symbol with a circle in front of it “°K”. It was changed later to just “kelvin” or “K” – but the photo suggests this thermometer is quite old and may be from before it was changed.